It’s one of Rockcliffe Park’s most spectacular homes and it has plenty of curb appeal. And it’s the stately home that was used in the film Mr. and Mrs. Bridges, starring Paul Newman and his wife, Joanne Woodward. 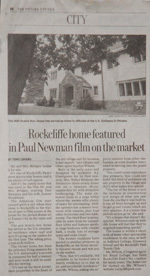 The American film stars caused quite a stir when they came to Rockcliffe in the winter of 1990 to film scenes at the house for the period-drama set in Kansas City in the 1930s and’40s. The 400 Acacia Ave. home has served as the U.S. ministerial residence since 1948 and now it’s going on the market for the first time. The asking price, a cool $2.85 million. The vacant home has been the principal living quarters for the U.S. ambassador’s second in command for half a century and next week it will be available for viewing. “It’s one of the most prominent properties in the heart of the old village and it’s location is just superb,” said Ottawa real estate agent Marilyn Wilson. Built in the 1930s and designed by architect A.J. Hazelgrove for its first resident, Mrs. Walter Bronson, the distinctive three-storey home sits on a spacious 28,225 square foot lot with attractive landscaping. The main entrance leads to a large lobby where the rooms offer plenty of space for entertaining, while the upstairs has a master bedroom with ensuite, plus four other bedrooms and two bathrooms. The third floor is accessible by stairs from the second floor lobby and features another large bedroom with ensuite bath, a study, lots of storage space and cedar closet. The former residents have moved to another property in Rockcliffe, so the home recently became vacant and was put on the market. “Now that it’s available, it’s available to be turned into a family residence or to stay as an ambassadorial residence,” said Ms. Wilson, adding she expects interest from other embassies, or even families interested in moving into the grand property. “The joy of the house is just the richness in construction and design of what you saw from the era that it was built in. It has all been brought up and its got grand rooms which are very spacious. It is a house that unfolds as you go in,” she said. The house is within a short walk of many other spectacular residences in the area, as well as Ashbury College, Elmwood School and the Rockcliffe Park Tennis Club. Ms. Wilson, a longtime agent for Royal Lepage, has been Rockcliffe Park’s No. 1 realtor for many years. The home can be viewed on Ms. Wilson’s website: rockcliffepark.com.